“Wine is not about grapes!” exclaimed Alvaro. Our host was oblivious to threatening rain on this steeply pitched hillside above Portugal’s Douro River. I struggled to keep up–and upright–as we charged along the narrow trenches between rows of closely planted vines. We were exploring one of the earliest Port wine estates in the Douro Valley. Our tramp through the vines turned out to be a study in passionate agronomy. Port wine owes as much to the rigor of cultivating these mountain vineyards, as it does to the aging process that takes place in the Port wine lodges of Vila Nova de Gaia. History matters here. “We don’t understand the new world if we don’t understand the past,” Alvaro insists us as we tour the estate in his truck. 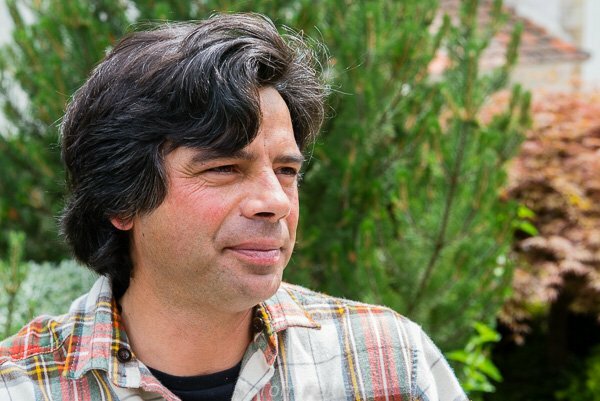 “I believe in the great future of this valley.” Alvaro Martinho is estate manager at Quinta das Carvalhas, inPinhão. One of six wine estates owned by Real Companhia Velha, it is the company’s proving ground for new methods, as well as a living archive of viticulture traditions. Born in the Douro Valley, Alvaro studied agronomy at University Real, and is raising his own family here. The borders of the Alto Douro Wine Region–inscribed on UNESCO’s World Heritage List in 2001–follow a natural boundary between the schist of the demarcated region, and the granite of the landscape around it. 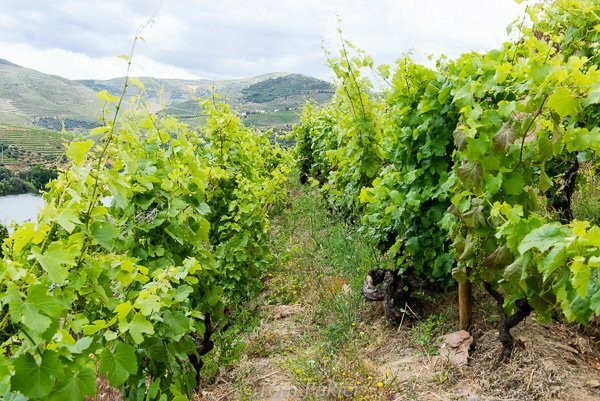 Wine has been produced here for some 2,000 years and this, along with time-honored farming methods, is a key element of the cultural landscape. Red and white wines are produced here, too, but it was Port that brought Tom and me to Pinhão. 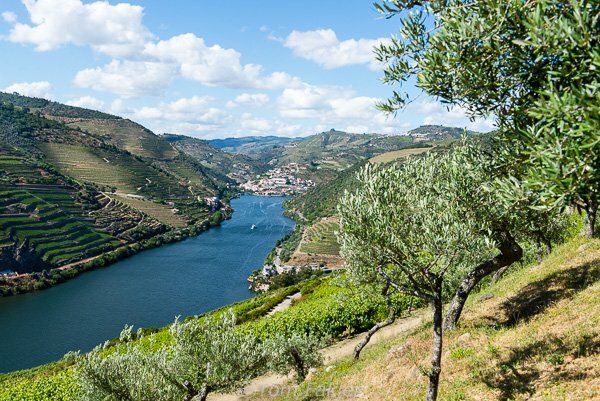 The deep, inter-connecting valleys of the Douro Wine Region have a classic continental climate, with bone-chilling winters and hot, dry summers. The combination of mountain, altitude and exposure–which includes 2500 hours of sun per year–conspire to produce what local vintners call “our gold”. 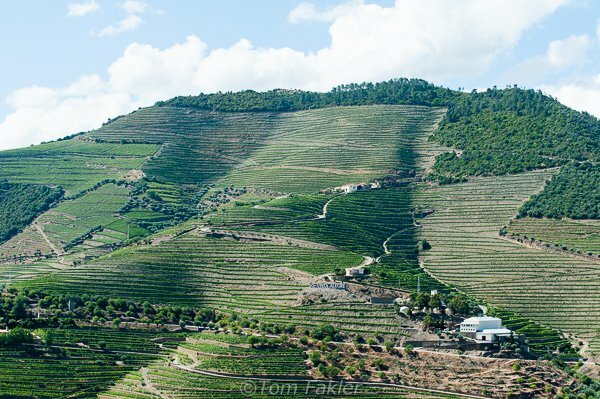 Douro vines have to be hardy to endure nine months of winter and three months of hellish heat (42 degrees Celsius in the shade). The free-draining schistous soil helps them succeed. For centuries, olive trees have been planted around the vineyards here. They contribute to the biodiversity of the landscape, while helping control erosion on the terraces. “Extreme quality comes from our natural conditions,” Alvaro tells us. To generalize, May has moderate temperatures, some wind and sun, but no rain. This is the time for flowering. June is cooler with some rain, and by July grapes are full on the vine. August is cooler yet in the evenings, with a lot of rain. Alvaro offers a local saying: “Hot in the day, cold in the night; use a jacket in August, it’s a great year for wine.” In September, after the rains, it’s time for harvest. Quinta das Carvalhas has a long history, with written references traced back to 1759, just three years after establishment of the Douro as the world’s first demarcated wine region. Prominently positioned on the left bank of the Douro River facing Pinhão, the estate is the largest in the region, covering the hillside and extending over the summit. The quinta welcomes 15,000 visitors each year, and aims to promote understanding of traditional Port wine cultivation. Plantings of azaleas, conifers, lantana, agapanthus and other local plants line the road up the hillside between vineyards of Quinta das Carvalhas. 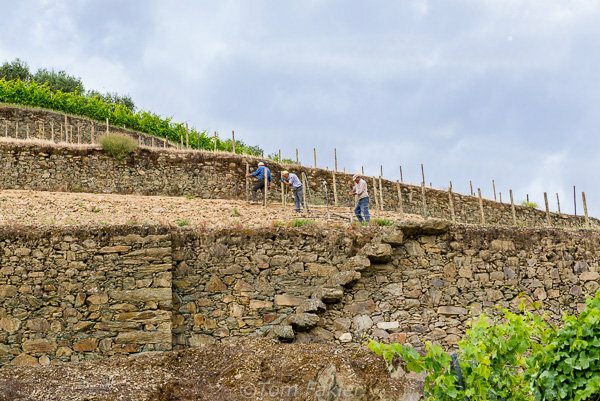 Workers at Quinta das Carvalhas prepare to plant new vines on the terraces of the estate. At Quinta das Carvalho, 80% of the workers in the vineyard are women. 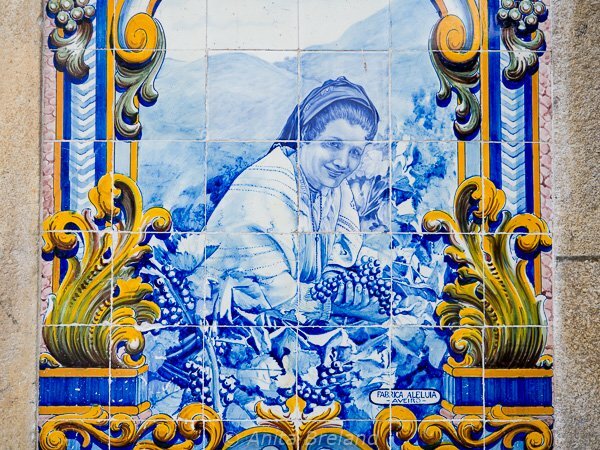 Tiles on the Pinhão train station tell us women’s involvement here is part of a long-standing tradition. Douro time is not measured in weeks and months, but years and decades. Plants survive here only by putting down strong, very long roots, penetrating deep to reach a steady, moderate water supply. At 15 years, the vines produce good grapes. At 50 years, system roots can reach five-seven meters. 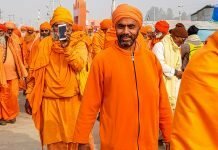 The extreme climate and poor land produces long life for survivors, but keeps output low, naturally. At Quinta das Carvalhas, four varieties were planted side-by-side almost 100 years ago, at an elevation just above the river. There, with a southern/western exposure and a concentrated environment, they experience extreme maturation, rather than the equilibrium desired for table wines. The planting, care and harvesting of these vines are all done by hand. At Quinta das Carvalhas, old vines with a southern/western exposure and a concentrated environment experience extreme maturation, rather than the equilibrium desired for table wines. Their roots chase rainwater through layers of schist deep into the earth, anchoring the vines above. Traditional cultivation of vines for making Port invokes an array of grape varieties known only in the Douro, and there are many of them. 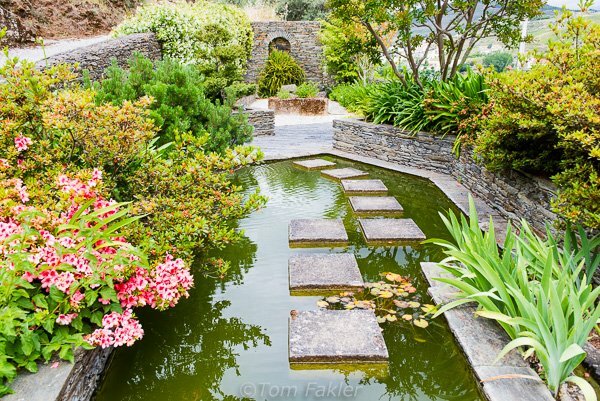 These sturdy plants are nurtured, but not irrigated. To the vintner, they say “Don’t touch me please, I’m happy” as they mature the seeds for the next generation. There’s Roufette, lady-like and elegant; Sosão, manly, strong, and muscular; Tinta francesca, elegantly feminine, a delicate vine producing no more than 0.7 kilos of grapes per season; and the unifier, Flor do Douro, which is less exciting, perhaps a little like a marriage (Alvaro’s words, not mine!). In the end, he insists, the best Port wines come from the old vines. Ah so. Wine, at least old Port, is about the vines. Even now, as new blends are created from the many grape varieties here, it’s all about locating, grouping and nurturing the vines in a unique environment. But that’s another story. Walking through the historic vineyards of the Alto Douro with someone so passionately engaged in preserving the region’s traditions was a highlight of our travels in Portugal. As newcomers to Port wine, we had enjoyed several glasses before visiting the Pinhão estate, including a tasting at Real Companhia Velha’s cellar in Vila Nova de Gaia, and a superb vintage Port from a very good year (1997) at our hotel in Lamego. Our day with Alvaro turned those samplings into a memorable feast of history and tradition. 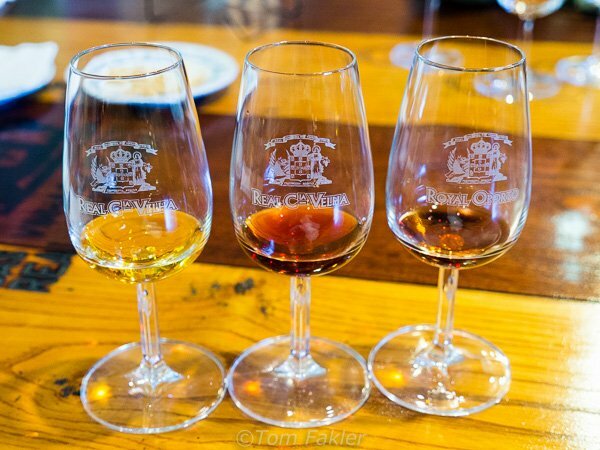 Port wines ready for tasting in the Real Companhia Velha’s cellar in Vila Nova de Gaia, Portugal. Quinta das Carvalhas and many other quintas are open to the public. There are Port tours and tastings aplenty in the Douro Valley, available through tour operators. 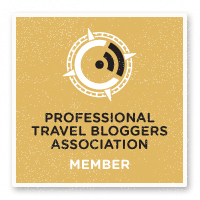 For the independent traveler, options for the various Douro Valley quintas, including Quinta das Carvalhas, are also offered via a recently launched wine Portal, Wine Tourism in Portugal. 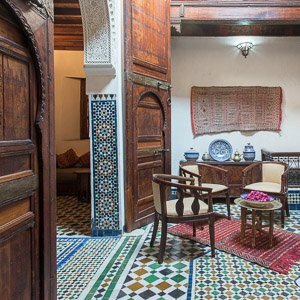 I’ve not booked through the Portal, but it looks promising! 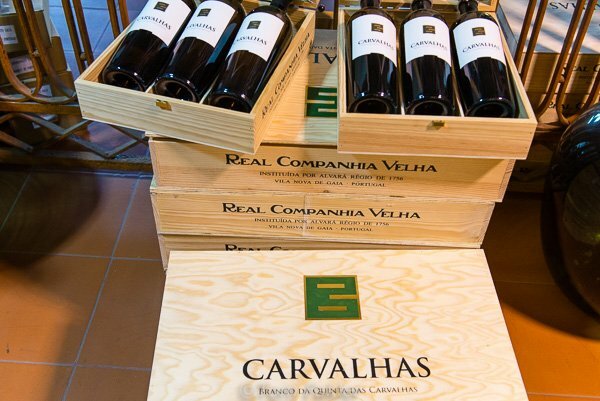 The wine shop at Quinta das Carvalhas is located at the entrance to the estate, and offers wine tastings and a wide range of Douro Valley products. Thank you to APTECE, the Portuguese Culinary Tourism and Economic Association, and Turismo de Portugal, for making our travels possible. Thank you for the fascinating virtual tour of the vineyards. I loved your description of the personalities of the various vines! I’m looked forward to my September Douro trip even more now. Hopefully, I’ll catch some of the harvest and maybe pick a grape or two if I’m lucky! Glad you liked the post. I’d love to be there for the harvest, but will miss it by a few weeks I think. Have a great time in the Douro! What a wonderful estate with such a rich history! 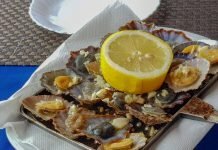 We haven’t visited the Douro yet but your post made it that much more appetizing! Thanks Irene, we highly recommend visiting one of the estates for a full-on port wine experience. Beautiful vineyard, no doubt the wine tastes just a little bit better in such a setting. The vineyard is in a spectacular setting, for sure, but the best part was our time with the estate manager! For me, the best place to enjoy a good port is a cozy setting, perhaps fireside, or after a good meal. Hi Anita. Thanks for the informative post. 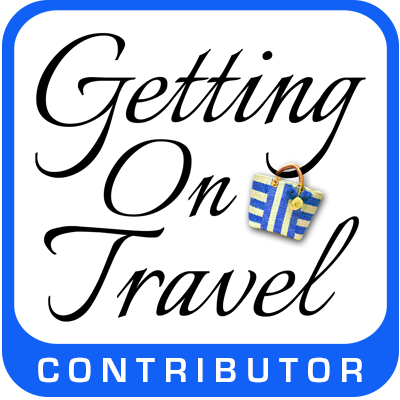 I am heading to Portugal for the winter, and can’t wait to learn more about their wines, visit the estates, and some sampling. I will definitely check out the wine portal. 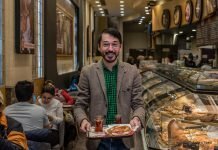 I will also be back to read more of your Portugal posts! Thanks for your comment, Nancie. Please let us know when you are in Portugal, and perhaps we will have a chance to meet up…we plan to be there in January for sure. It was great, Noel! And we highly recommend topping off an estate tour with a sampling. Portugal looks so lovely and I would love to learn even more about Portuguese wine. I’m a big fan of Port wine and would love to visit Douro for a tasting. You’ve inspired me to do some investigating. If you like Port wine, there is no better place to learn more about it than the Douro…and then there are all the other fab wines from the region. Too much choice!